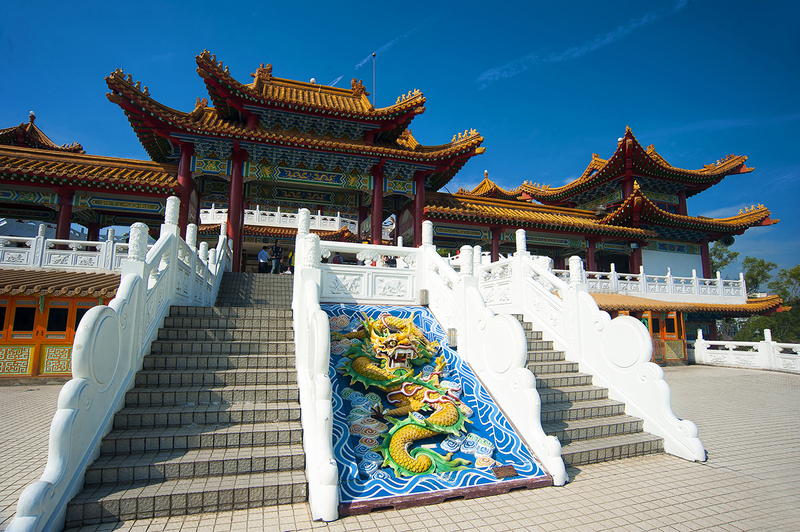 Visit Thean Hou Temple, a six-tiered Chinese temple. 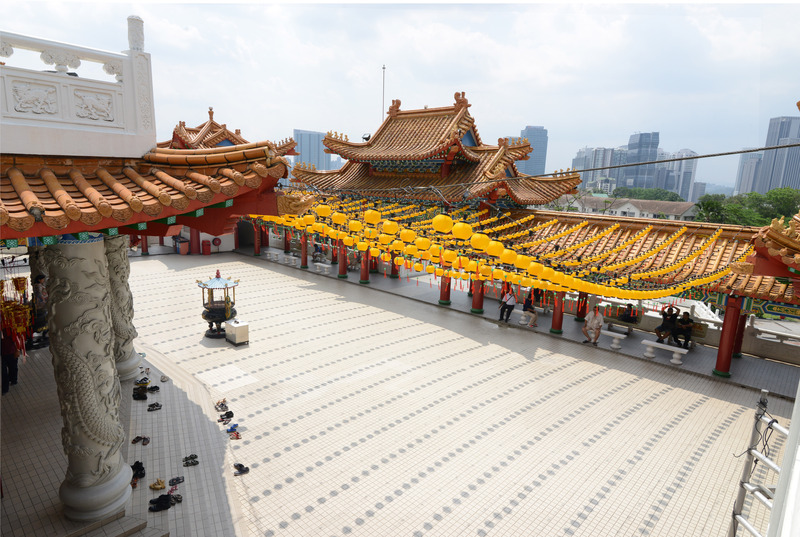 Built by the city's Hainanese community and dedicated to the goddess Tian Hou (The Heavenly Mother), the temple was completed in 1989. Enter the prayer hall to admire the three altars, with their gold statuettes of three goddesses and offerings laid at their feet. The monumental architecture of the buildings follows a classically Chinese design, with thick red pillars, upturned ornamental pagoda corners, and intricate, colorful repeated patterns. Quickly create a custom-made itinerary for Kuala Lumpur using our trip planner. 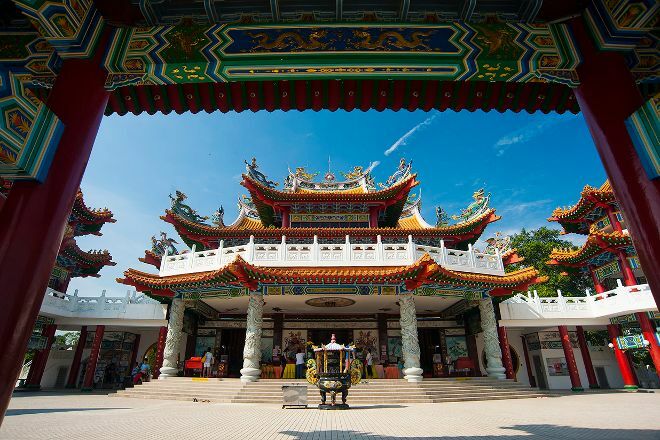 One of the most beautiful Chinese temples in Kuala Lumpur. A must visit for tourists. It's a bit further inside from the main road, so no easy nearby public transport to get here. There is quite a lot of parking space for drivers. There are 4 or 5 main areas in the temple to visit. When one arrives, there is the courtyard and garden outside. The garden has statues of the animals of the zodiac and other deities. Then head up to the main temple on Level 2. A very good place for photos. Just be mindful not to intrude people who come to pray. In the main temple, visit the 3 main deities. And then head up to the upper floor for a better view of the entire temple. Head also to the back of the temple for the statue garden and read the stories of each of the persons portrayed. Then head down to the lower ground for the canteen, drinks, food and souvenir shops. Best time to come will be early morning or later part of the evening. Afternoons here are really hot. A must visit. If you are photographer, stop by to show off your photography skill. Or if you want instagramable pictures, or you just simply want to pray. People often come here to pray to make sure you respect others by not making any loud sounds. You can take taxi from the closets station, or bring your own vehicle. Tip: 1. The entry itself is free, but if you want to try fortune telling you can go inside, there is a money banks (?) Where you can put any amount of money, then go to the sticks beside it and mix (?) Them. Do not forget to pray then you grab one stick, see the number, and match it a rolling shelf (?) Beside it. Take one and you got your fortune telling! I think that is the most fun part. 2. There is canteen + souvenir shop downstairs.